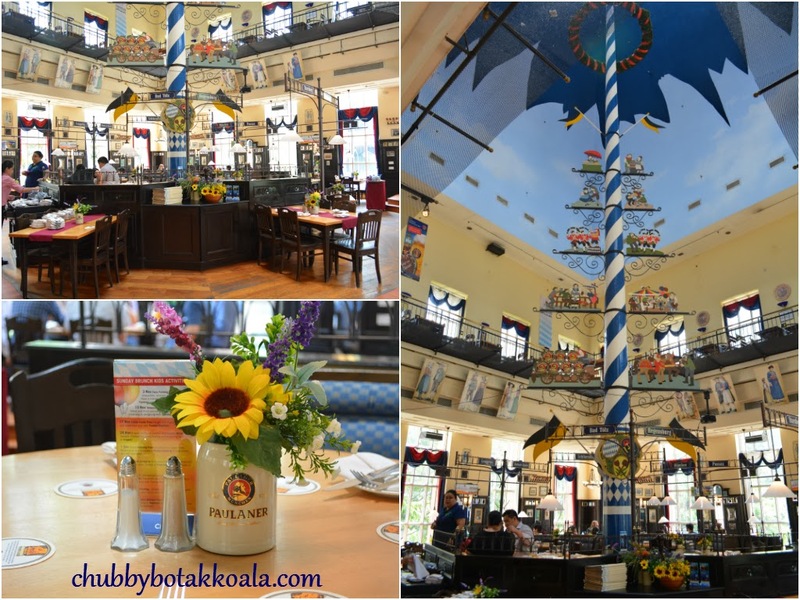 During the month of November and December, Paulaner has lunch special price at $14.90++, including free flow of soft drinks. 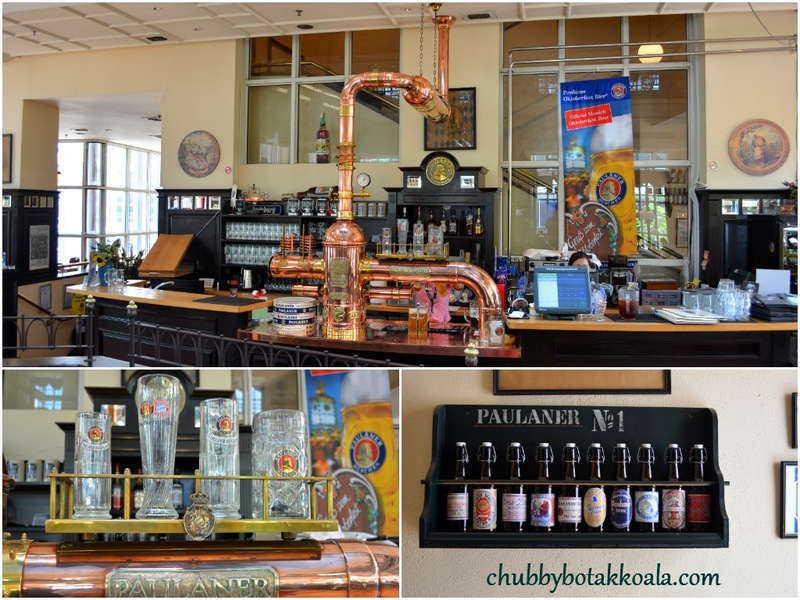 Of course the best offer is 2 glasses of 0.3L freshly brewed Paulaner Beers @ 12++ to complement the lunch special. Well, a couple of sip of this golden liquid won't do you any harm for afternoon lunch isn't it. The first floor of the microbrewery is allocated for brewery and bar, the second floor is for the restaurant / dining hall, while the third floor is for the storage of the beer / dining area of needed. There is outdoor seating on the first floor for those who preferred Singapore fresh air. The centre piece of the dining area is the 2 storey totem that was erected from the second floor to the third floor. Quite amazing indeed. The natural light that filled the room during the day brings a warm but cooling atmosphere to the dining hall. As a typical foodies, we did not limit ourself to just the set lunch menu, we also ordered from the main menu as well. For appetizer, we were served slices of rye-wheat (Roggenmischbrot) and whole-grain (Vollkornbrot). The bread texture is dark brown and more condense compare to the french bread. The crust is thick but the inner part is soft. To accompany the bread are butter and pate. The food came in no particular order and we (5 adult and 1 child) just share the food as it comes. Grilled Bavarian meatloaf with fried egg and potato salad ($16.80) and Deep fried crumbed Camembert Cheese, with toast, mixed salad and cranberry cream (Lunch Menu – 'LM'). The meatloaf has a similar texture to ham, but nicely grilled. It is nicely seasoned and not salty, and goes well with the mustard sauce. The Camembert cheese is coated with bread crumbs before frying. The cranberry cream combination has a nice fruity taste remind us of the upcoming holiday season. Combining the toast, cheese and the sauce is just delicious. Braised Leg of Australian Lamb, on mashed potatoes and mixed seasonal vegetables (LM). Interesting part of the lamb to be braised. The meat is just tender and flavourful without the strong gamey smell. The mash potatoes is smooth and fried onion on mash just give a different texture to the dish. Potato rösti with dry smoked ham and Gruyére cheese au gratin ($13.80). One of the popular dish in the Alps (including Swiss and surrounding area). To my surprise, the cheese and rosti is light in seasoning. The potato is most with buttery richness. The saltiness actually come from the dry smoked ham. The melted Gruyére just bind the dish together. Yummyyy!! Of course the visit to German Restaurant won't be complete without the Crispy Pork Knuckle ($29.80). The crispy pork knuckle were cut to smaller pieces, served with mash potatoes, sauerkraut, bread dumpling and gravy. It has a superb crackling but the meat remain tender. Some outer part of the meat without the skin are also pretty crispy. Sauerkraut helps to maintain the balance of the dish so it does not become overwhelming, and the gravy to accompany this dish is just wonderful. The bread dumpling is dense and solid, something that we are not used to. The service during our lunch is good. The service staff are very friendly and attentive. The food came at a regular interval which was very good that we can complete a dish without overcrowding the table. When serving my birthday cake (Check out Lady M review), they generously provide utensils for it. Overall, we really enjoy our dining experience at Paulaner. The lunch menu is just value for money, even for the item from regular menu. It has a very well balance taste and easy on the palate. I really look forward to my next visit, hopefully I don't need to wait for another 8 years . Cheers!! !